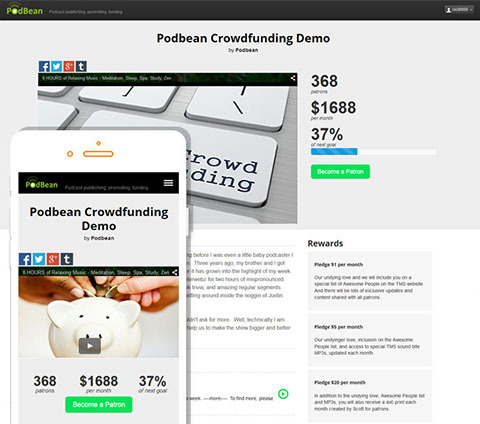 Podbean has just launched the first crowdfunding platform exclusively for podcasters. With Podbean Crowdfunding, podcasters can easily raise a monthly income stream to support their podcast’s continued growth and development. 1.Fans can become patrons without extra steps, directly from Podbean’s app or your podcast site. Easily add badges to any site and share on social media for more exposure. 2.Patrons can support you with monthly pledges at various levels (you choose support levels, rewards and goals). 3.Easily manage and thank your patrons, check pledges and receive payments, right from your Podbean account. 4.Set up is EASY and totally FREE! Sign up today at http://www.podbean.com/crowdfunding. *Podcasters who do not use Podbean for hosting can still participate in Podbean Crowdfunding, by simply signing up for a free account and verifying ownership of the podcast they wish to fund.